Applications provide targeted details for recording, analyzing, and reporting a wide array of life science physiology data. Applications include Advanced Features for the selected area of study, with available automation routines and suggested hardware packages to complete wired, wireless, or MRI setups for human or animal studies. Choose a field of study below and View Applications, or click below to search the Signals & Measurements index. 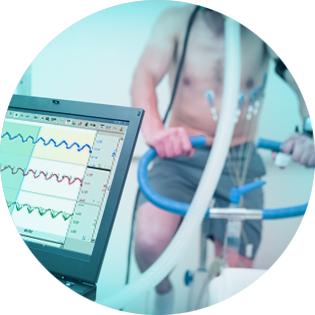 Record physical parameters for body movement or exercise, including airflow, temperature, angle of movement, etc. Synchronize with high-speed video for frame-by-frame analysis. Solutions for automated analysis of all hemodynamic signals, including: blood pressure, blood flow, ECG, LVP/RVP, and temperature. Human, animal, and MRI systems. Record or log physiology data from subjects in the real world—untethered setups provide freedom of movement in natural environments. Wired, wireless or MRI hardware and software solutions for emotion, arousal, stress, cognitive assessment, group interaction, startle, and other psychophysiology and neurophysiology research. System-level solutions for recording human or animal data during magnetic resonance imaging (MRI for fMRI) or functional near infrared spectroscopy (fNIR)/NIRS) optical brain imaging. Multimodal Stimulation (visual, auditory, olfactory, haptic, and electric), programmble stimulation, automated event marking & scoring, and VR/Immersive Solutions with Physiology Data. BIOPAC provides a wide range of options for animal and tissue experiments; study animal and human species for comparative physiology programs. Proven data acquisition & analysis hardware and software that supports a wide variety of life science research. Use BIOPAC or 3rd-party equipment. Commonly performed life science measurements and suggested BIOPAC recording hardware, software, and automated routines for data acquisition and analysis.